GFS has Northern Hemisphere temp anomaly plummeting without end right now, reaching the low for the year. In Stockholm, apartments are now heated with wood chips from Brazil. What a warm and cozy Christmas we'll have, filled with an abundance of presents and food. Hopefully a cold and white one outside as well. Yes, we just want it all. Perfect, Santa's SW made all our wishes come true! U.S.: Extremely rare tornado touched down in Washington State recently. A very rare #Tornado touched down in Port Orchard west of Seattle ~2 PM PT. The odds? From 1954-2016 Washington State had 118 tornadoes (1.9/year) and only 5 (4.2%) in December. California to get some New Year rain? I usually ignore anything from GFA beyond 5 days, but recently it has been doing rather well. So here we go. The first image for Dec 31 is what I think we have been seeing for what seems like ages - a high blocking any chance or rain for California. The second image for Jan 5 shows the high pushed away and a low bringing rain from the South West for California. The 3rd and 4th images show the change in 250hpa wind on those 2 dates. A big change. Will it happen? Nowt to do but wait and see. The death toll from Storm Usman that struck the Philippines shortly after Christmas rose to 68 with the number of fatalities expected to climb even higher, civil defence officials said Monday. While it did not have powerful winds it brought heavy rains that caused floods and loosened the soil, triggering landslides in some areas. One official told AFP news agency that people did not take precautions as it was not classed as a typhoon under the government's alert system. Unfortunately, the results of the study suggest a relatively high sensitivity of tropical extreme rainfall to global warming. having enjoyed a totally benign mid-winter , the next 10 days here in N. Ireland will enjoy a settled spell with a positive pressure anomaly of 30 to 50 mb over the period . This is exceptional especially as it looks as though the period will be frost-free . After last year's snowy winter we have not had any even threaten this winter . So mild is it that my first snowdrops appeared on Christmas day and already several thousand are out .. about 3 weeks ahead of last year. Happy New Year to everyone .. may your weather be as kind to you next year as mine was this year .. b.c. More unseasonable rain here in Southern Ontario. Memories of trudging through snowbanks while costumed for Halloween seem almost a fantasy, and White Christmases become rarer each decade. The annual Spring floods caused by ice dams are a fading memory, as is the annual contest to guess the timing of the ice breakup on the river. It's only frozen across three times since 2004 when I returned. In most recent years I've been able to see grass every week of the year which is so very different from the frigid winters experienced here in the 1950's. We may have lost the destruction of the yearly spring floods, but tornadoes that used to occur far to our south now wreak havoc locally. Kids no longer trust the ice on local ponds for impromptu hockey games, and schools no longer freeze and scrape outdoor rinks. I haven't seen a horse drawn "cutter" since my return. The temps, they are a-changing. El Niño is a reference to Christmas " the child " but Christmas is past and we are not doing well for water supplies. The El Niño is looking late if it arrives at all and I am having doubts. We are at ~60% of average rains so far and our main reserviors are shrinking still. The water managers are bickering and there is still lots of housing development and growth going on. Going into a ninth year of drought and really we should be starting to accept the new normal. Terry, I would much prefer no snow to no water at all. I do get well water and I will be fine for awhile still, no worries. The beaver and the steelhead are struggling and the Feds mandate some water releases for them but the grapes, tourists and housing developers are thirsty and in reality the steelhead are functionally extinct already. We are entering an era of triage, pick your winners and losers well but progress must push on. Hope your water table is stable. A drought here can't be compared to one in California or Nevada, but with no provisions for irrigation there can be measurable crop losses. The water table hasn't dropped over my lifetime, but with large population increases, vineyards creeping closer each year and the loss of winter snow it's just a matter of time. I'll check next time I'm down that way, but I don't think our vineyards are irrigated. We're in a little pocket that never did get lake effect snow and the now balmier winter skies drop whatever moisture they have as rain more often than not. A dusting of snow at night that's washed away in an afternoon rain seems the new norm. Did you have any luck harvesting and processing your aloe hearts? Terry, No yucca harvest yet but thanks for the reminder. For sure yucca can take the drought. My water is riparian but where I am on the river it is fed by flows from an upland aquifer. I think everyone knows S.Cal is impossibly dependent upon vast engineering projects to maintain population. I always did enjoy living on the edge although I think maybe white sharks aren't as scary as the prospect of my neighbors running out of water. Water flows to money so I won't fare to well competing with the other locals even if my wells do hold. Might need to think about sinking one the government doesn't know about. That legal ? Most states want to know ... i know in the midwest they do. I know of some on Navajo lands and other first nation lands that were ... unofficially ... dug, but especially out west whiskys for drinking and waters for fighting. Where I mostly play, east of the Mississippi, state wants to know about all wells, all septic systems, irrigation pumping from all streams. In pennsylvania DNR guidance was that you keep track of how much you pump out of streams for irrigation and never, ever pump so hard you reverse streamflow downstream. Similar in OH, IN, IL, IA,KY,TN,WV. Sidd, No but they can't take me in for what I'm thinking. In Chicago, we used to frequently get long stretches of sub zero lows in January with snow covering the ground from mid December to February. We now only rarely get a night with temps below zero (Freedom Degrees ) and snow cover rarely lasts more than a week before melting. Cook County forest preserve use to maintain toboggan slides on hills throughout the county that would be used by thousands through the winter. They started removing them a couple of decades ago because of the cost of upkeep and that they were rarely opened due to lack of snowfall. During the current blast from the Arctic, Bay of Bothnia had wind speeds of category 1 hurricane equivalent. While not the first winter storm to do so, the record 10 min sustained speeds of wind is now 32,4m/s for the Finnish side of the bay. Gusts reached 40,2m/s, and hurricane-force limits also on coastal stations. Update, the one fatality in Finland due the storm was after the storm, when a man clearing fallen trees had an accident with the tractor he used as help in claring the way. The three finnsh and one swedish person trekking out in Norway are still missing. And of course the same storm caused (at lest partially) the train accident in Denmark with 8 fatalities. Update: the four ski-trekkers now presumed dead in an avalanche, two of them had some training to be wilderness guides. The city of Wismar in the northern Mecklenburg-Western Pomerania state was one of the worst hit. 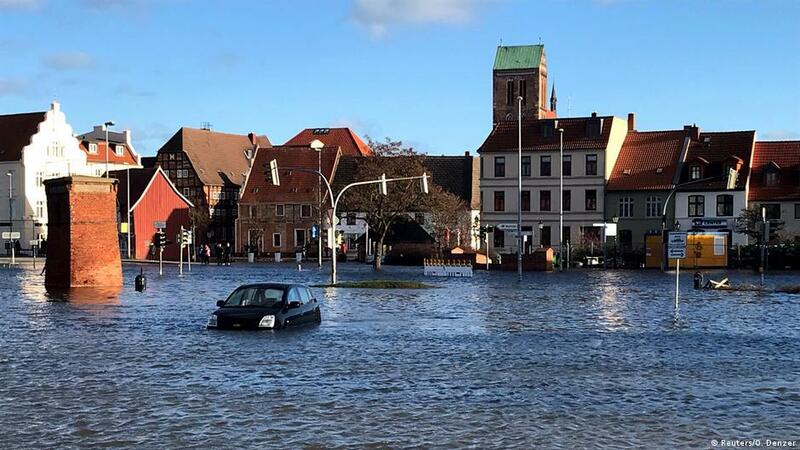 The water level in the morning rose as much as 1.70 to 1.80 meters (up to 6 feet) above normal, flooding Wismar's historic city center. Up to 270 containers had fallen off the Panamanian-flagged MSC ZOE, one of the world's biggest cargo ships, in rough weather near the German island of Borkum in the North Sea, the Dutch Coast Guard said on Wednesday. The containers floated southwest toward Dutch waters and by mid-afternoon on Wednesday, more than 20 containers had washed up on the Dutch islands of Terschelling, Ameland and Vlieland. Local media carried pictures showing a surge of curious people checking out what washed up. A person was seen carrying off what appeared to be a flat-screen TV still packed in foam. The residents of these islands have a centuries-old tradition of collecting goods that wash up on their shores. Scientists are seeing signs that global weather patterns toward the latter half of January and into February may shift significantly to usher in severe winter weather for parts of the U.S. and Europe. How it works: The possible changes are being triggered by a sudden and drastic warming of the air in the stratosphere, some 100,000 feet above the Arctic, and by a resulting disruption of the polar vortex — an area of low pressure at high altitudes near the pole that, when disrupted, can wobble like a spinning top and send cold air to the south. In this case, it could split into three pieces, and those pieces would determine who gets hit the hardest. The big picture: Studies show that what happens in the Arctic does not stay in the Arctic, and rapid Arctic warming may paradoxically be leading to more frequent cold weather outbreaks in Europe, Asia and North America, particularly later in the winter. They advise people to not open or touch the containers since there is at least one container with dangerous goods under them. fake news from insurers probably to shy looters off and limit the damage. dangerous goods must be stored separately and certainly have to be prominently marked as such by international law. and then we've seen in the past that no laws and/or warnings and not even police patrols ever kept people from taking advantage of such events. and in the UK it's prohibited to keep such loot re-enforced by local laws. I highly doubt German public media would spread fake news in order to keep goods 'save' that are insured (and likely destroyed) anyway. The harm was already done when the containers left the ship. I know for a fact that containers with dangerous goods are mixed with 'normal' goods on container ships. It is correct they are labelled as such but average Joe don't know what those labels mean. Dry in the west, though. Brian Brettschneider: "Map showing where 2018's precipitation ranked compared to all other years. Nearly half of the areas east of the Mississippi River had a top 10 wettest year. It is minus 33 degrees here in Dawson City Yukon this evening. I'm teaching a Wilderness First Aid course, which involves a certain amount of rolling around in the snow simulating injuries, and of course, rescuing the ill or injured "casualties". My students are Canadian Rangers, probably about the most competent outdoors people in Canada. We are all complaining about the cold snap. When I check the weather forecast for the next five days of the course, it will continue in the minus 30s. We are all not very happy about this. Brrr! However, also in the forecast are the climate norms for this season. Guess what the normal low for this date is? Yup, minus 30. 20 years ago, we would have found minus 33 to be quite pleasant, and would never have dreamed of complaining about temperatures above minus 40. Now THAT is an indicator of global warming. The biggest change we are seeing here is the loss of the coldest temperatures. The link is subject to change as the day progresses. At 20 UTC tonight (9th Jan), at Dalatangi in the eastern Fjords area of Iceland, the temperature is an incredible 18 C.
Which continent is hit (first) is still uncertain. They got it right (sort of). This article from wunderground is a good read for the non-meteorologists amongst us. And Europe has een the consequences already? They are saying it is not good news for Italy (and a lot of mainland Europe) over the next few weeks as can be seen from this link and the attached image. I selfishly hope the image is correct - England avoids the worst. The polar vortex splits, sending frigid air howling into the U.S., Europe. Conditions could remain into March. The big picture: The switch to a cold, snowy pattern from the Midwest to the East Coast has its roots in an event that took place in December and early January at about 100,000 feet above the Earth's surface. Temperatures in the stratosphere suddenly spiked, in what's known as a "sudden stratospheric warming" event. This gradually disrupted the polar vortex, much like a person bumping a spinning top and causing it to spin off balance, slow down and meander drunkenly across a table. Experts told Axios that what's happening now — with a major winter storm about to cross the country from west to east, dumping 1–2 feet of snow in the Northeast and opening the gates to Arctic air behind it — is indicative of a weather pattern triggered by the stratospheric warming event and polar vortex split. Some of the biggest East Coast snowstorms on record, ones that paralyzed the big cities from Washington to Boston, occurred when such blocking weather patterns were in place. The bottom line: Get your cold weather gear ready. Tens of millions from the Midwest to the East Coast and over into Europe may be in for a wild ride during the second half of the winter. Extreme temperatures are persisting – and even peaking – in Victoria and New South Wales on the fifth day of Australia’s extraordinary, record-breaking heatwave with Noona in western NSW recording a minimum temperature of 35.9C, a new Australian heat record. On Friday, parts of NSW and the ACT were again forecast to soar above 40C – for the fifth day in a row. In Penrith in Sydney’s west, temperatures will hit 45C, up from 42C on Thursday. In Menindee – the site of mass fish kills in the Murray river – another 45C day is on the cards. It reached 47C on Wednesday and Thursday, and the maximum temperature hasn’t been below 45C since Monday. Rebecca Farr, a forecaster for the Bureau of Meteorology, said Canberra would break the record for the longest stretch of over-40C days since records began in 1939. "go West, young man, go West"
"GO WEST, YOUNG MAN, GO WEST" was an expression first used by John Babsone Lane Soule in the Terre Haute Express in 1851. It appealed to Horace Greeley, who rephrased it slightly in an editorial in the New York Tribune on 13 July 1865: "Go West, young man, and grow up with the country." This is a nice article from Wunderground for amateurs like myself on the why and wherefore Central / Eastern North America is getting a double dose of brrrrrr cold. Also a note on the reason for the 4 Nor-Easters last March and that as yet the signal is not there for a repeat this year. Often when the Arctic Oscillation is in a negative phase, the North Atlantic Oscillation (NAO) is also negative. A negative NAO typically corresponds with a setup where there is a weakening area of low pressure near Iceland and an area of high pressure near the Azores. This setup combined with a negative AO increases the chances for bitter cold to push southward into the U.S. and the chance for snow in the East. In March 2018, the NAO was in a negative phase for several weeks. This produced four nor'easters that brought heavy snow, blizzard conditions and coastal flooding to parts of the mid-Atlantic and Northeast. There is not a clear signal that the NAO will be in its negative phase now. However, this jet stream pattern is not necessary for arctic air to reach the U.S. or for big East Coast snowstorms. The NCEP GFS 0.5deg analysis 2m air temperature has the Northern Hemisphere average temperature dropping to it's lowest in at least 4 years over the coming 7 days. Not sure that qualifies as weird. Lowest temperature in at least 4 years does not sound too far from normal. Hmmmm....if I read this chart correctly, the temperatures will drop all the way to the average temperature for the days in question. What is weird about this? -37 degree celsius for Chicago next week. Seems like under the new climate regime it's unusual for the northern hemisphere average temp anomaly to drop so low... and at this time of year, means cold temperatures. Under the current administration, is this trutworthy? Anyway somewhat interesting and some further evidence mighr result that the highest relative anomalies have moved to southern hemisphere. Aggghhhh...cold temperatures in the wintertime. Damn you're being a stickler. I can't say I didn't walk into it though. I'm not complaining about cold... I come from a cold climate. Cold is not weird. I meant unusually cold is bound to be the case in many places over the coming week. I was hoping my post would bring about a discussion of what's happening in the northern hemisphere right now weather wise, so that I could learn something... I figured there must be something going on to cause a drop in anomaly like that if it hadn't been seen in AT LEAST 4 years. Warm Arctic, Cold Continents? Did our Polar Vortex break up again? The WACC weather is hitting me hard here in Southwestern Ontario. Possibly the coldest snap since I came back home in 2004. The river is frozen and so am I! I agree with you. I would love to see some of the good old discussions we use to get on here by the weather experts. Lately they have been quiet. If you are looking for info on the current cold anomalies, I suggest going to twitter and searching for Judah Cohen (@judah47). He is a climate scientist that has been following the polar vortex since November. I enjoy reading his posts. Search back through his tweets, and I think you might find some of the information you are seeking. Hopefully, as we get closer to the melting season some of the resident weather experts will become more chatty. If you are looking for info on the current cold anomalies, I suggest going to twitter and searching for Judah Cohen (@judah47). He is a climate scientist that has been following the polar vortex since November. I enjoy reading his posts. I enjoy reading them too. But frankly the SSW has not delivered any real cold for western Europe. The ECMWF forecast heading into February and still no sign of northern anticyclonic blocking,, no reversal easterly flow. Instead the Azores high reigns supreme. If GFS is to be believed (quite a large if), it is the vast contrast between +ve and -ve anomalies in the Arctic and beyond that is the story at the moment, suggesting cold air moving south out of the Arctic and warm air moving north into the Arctic at various times and in various localities, e.g. the current warmth in Alaska turning to cccooollddd. This suggests that the effect of the early January SSW and the resulting PVS continues. Thanks all for the informative replies! If you're 25 or younger and live within a large swath of the Midwest — from Minneapolis to Chicago — this week will feature the coldest temperatures of your life as a lobe of the polar vortex plunges south out of the Arctic. This is not "just cold" or "normal". There is a decent chance Chicago will set its all-time record-low high temperature, and possibly its coldest temperature on record, as well. The current records are -11F and -27F, and the current forecast high for Wednesday is -16F. If that comes to pass, the old record will literally be smashed to pieces. Why is this happening when CO2 is +15% vs. old records if the conventional narrative re: AGW is to be believed? Something does not jive here, and I believe that the increasing displacement of the tropospheric PV into the mid-latitudes due to AGW is now having increasingly severe impacts on populated regions. Wawa Ontario is famous for being the black hole of hitch hiking, there are tales of people never getting a ride from there and having to move in. Tonight will be a particularly evil night as the temperature drops to -42C. Why is this happening when CO2 is +15% vs. old records if the conventional narrative re: AGW is to be believed? It's just weather and wobbly jet streams. There are plenty of extremes being set all over the world. Most of them in fact are heat records but of course there will be some cold records too. We could also for example be flooding this thread with new heat records from the southern Hemisphere. Argentina, Australia, Chile. For proof of GW, you need to observe the much longer trends and anomalies but understandably when it's -30 C, the general populace may find this difficult to comprehend !